In April of 2015 the filmmaker Petra Buda and the ethnomusicologist Edda Brandes started to document the musical heritage of Mauritania for two weeks. They recorded nine different musical genres and the women poet Leila mint Chigali in picture and sound. The results ran into a CD- and DVD production. Religious songs and songs of praise for the Prophet comprise an important part of Mauritanian musical practise. 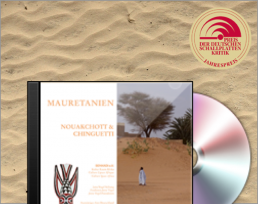 This collection takes a look at the modern traditions of Haratin musicians in Nouakchott and Chinguetti. In addition to kettle drums, the tidinit lute and the neyfara flute will be heard. Contemporary bands round off this selection with their own unique repertoire. With financial support of the Jutta Vogel Foundation and the Ministry for foreign affairs, Germany.